Per the epistle–authored by a dying vet in hospice care–Bush and Cheney are guilty of “war crimes,” “plunder,” “lies, manipulation, and thirst for wealth and power.” In his eyes, this dynamic duo “stole the future” of veterans, sacrificing them for “little more than the greed of oil companies . . . oil sheiks . . . and insane visions of empire.” Charming tale. Regrettably, journalist Dylan Stableford reports these claims with virtually no comment. That’s how they roll at the Yahoo News blogs. Parrot liberals, ignore or spin conservatives. This particular, gratuitous airing of invective compels a response. So here I’ll dispel three commonly-believed fictions about the Iraq War. With these words, you can just imagine the shrill cries of Code Pink ladies now. The question is, which deaths were Bush’s fault? Most Iraqi civilians died at the hands of insurgents or inter-sectarian strife, not Coalition forces. Yes, over 4,000 American soldiers died, with many more seriously injured. With all due respect, this should not be an unexpected outcome for those who voluntarily join the armed services. All the more that we’re grateful for their service. That said, it’s just not evident that President Bush did something heinous in exercising Congressionally-authorized use of military force to protect America. Speaking of authorization, what part of the invasion rationale was a lie? Max Boot pointed out recently that every intelligence agency worth its salt suspected Iraq of harboring weapons of mass destruction. This is because Saddam Hussein wanted everyone to think he had them, including potential usurpers within his own regime. This is the particular problem of one man dictatorships. It’s only a matter of time before such an actor miscalculates, hurting his country, his neighbors, and in this case, himself. Returning to the charge of lying, a lie requires intent of deceit. And again, that’s not at all clear with Bush and company. This charge gets to the motivation for the invasion. There are some interesting circumstances, such as the Bush family’s Saudi connections and the shortcuts taken by Cheney-affiliated reconstruction contractor Halliburton. These could make for interesting premises, but as with most conspiracy theories, there’s nothing outside of a tinfoil hat to connect the dots. Such speculation crumbles in light of the facts. I’ll unfurl this with a personal detour. I was an undergraduate studying international relations at the time the Iraq War started. In fact, I was taking a political science course on national security. Just prior to the invasion, we read the then-recently released hardcover The Threatening Storm: The Case for Invading Iraq. The author, former CIA analyst Ken Pollack, was with the Brookings Institution. And oddly enough, the book jacket featured advanced praise from future Newsweek and TIME editor Fareed Zakaria. Suffice to say, I learned a thing or two about war. When it comes to why wars start, the reason is simple. It’s not about land, wealth, or religion. The, greatest empirically correlated factor is that both sides think they can win. This is where miscalculation comes into play. 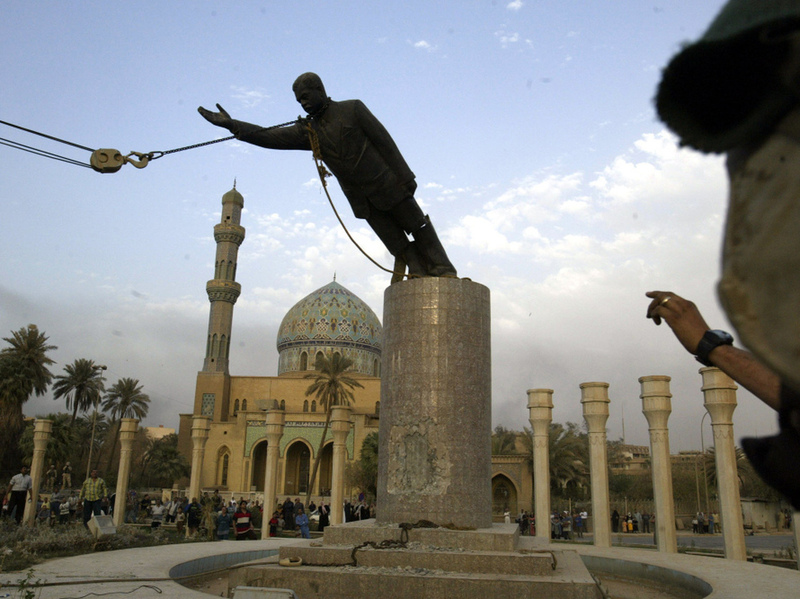 Saddam was widely seen as an “irrational actor.” Given his reckless history and total lack of cooperation, the security community consensus was that it was prudent to take him out. This won’t allay the critic who still points to all the oil in the Persian Gulf region. I agree, oil is a big factor! But the motive isn’t “greed,” it’s global stability. Europe, an indispensable contributor to global economic well-being, has the most to lose from a destabilized Middle East. By contrast, the U.S. only gets 13% of its oil from there. But because of Europe’s vulnerability, you would feel the hurt if things really went south in the Persian Gulf. A second dichotomy critics force is that, if we hadn’t gone into Iraq, there’d have been billions of dollars freed to invest in American education and infrastructure. If Barack Obama is The Messiah, then those who spouted this view pre-2008 were John the Baptist! The Iraq War was budgeted as emergency spending, and the money wouldn’t have been spent otherwise. The counterfactual of domestic spending nirvana is false. I truly appreciate it when someone has good reasons to disagree with me. But there are those who hold popular positions without really thinking through the implications. Nothing exemplifies this more for me than John Lennon’s syrupy song Imagine. Some think it’s nice to be a dreamer and imagine that there could be a better world. The problem comes when they want to foist an impossible dream on others. As long as humans inhabit the Earth, it will be a dangerous place. In light of this, sometimes unpleasant choices have to be made. Don’t rewrite the facts to fit your feelings.